Take cauliflower, cut in to small florets. Take a bowl, add plain flour,corn flour,ginger garlic paste, seasoning to make a fine batter. Dip the cauliflower in the batter, deep fry in oil. Recipe is simple with less ingredients..looking delicious sri..
wow cauliflower looks so crisp. yummy. looking gorgeous!!!! I will try this! Simple and yummy. Also Nice Click. Hey,Something is awaiting for you in my homecooking blog. Pls check it out. looks really delicious sripriya. By saying plain flour u mean rice flour? just curious. Simple and delicous this 65! Sounds simple...Looks spicy and yum. mmhh nice 65 with Gobi Priya. I love Gobi very much.Hope u had nice weekend. Very simple and nice recipe.....I suppose it is not overly spicy either, 'coz of the Kashmiri chilli pwd, right??? 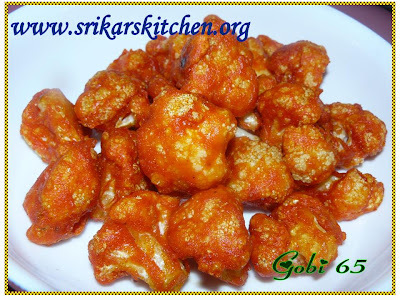 Gobi 65 looks super crispy and yummy! I would love to have few of those delicious crunchy cauliflower. Simple and delicious Sri...very tempting. The gobi65 looks simple and delicious.